When we are researching for places to spend our vacation, I always ask Jeanne to make sure that the place where we’ll be staying has internet access. Because perish the thought that I take a vacation where I can’t get a little Gadgeteer work done too. We went on our last vacation knowing that there wouldn’t be any internet at the cabin we were renting, but I stuffed down my panic because I knew we’d only be gone for 2 full days. And as luck would have it, I had a secret weapon to take with us… the Skyroam SOLIS 4G LTE Global WiFi Hotspot. 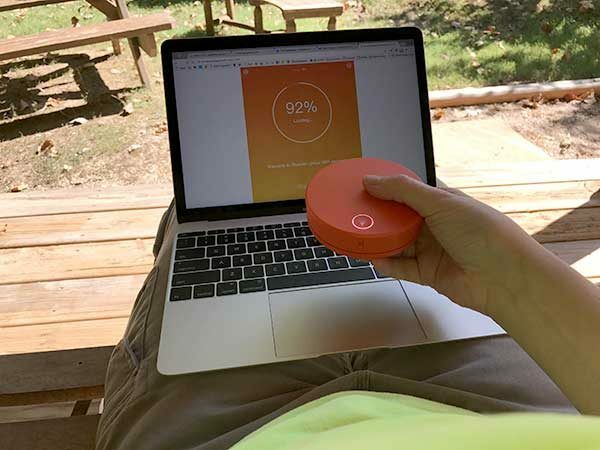 The Skyroam SOLIS is a portable 4G LTE WiFi Hotspot and 6000mAh power bank that provides unlimited daily internet connectivity by using Skyroam’s proprietary global WiFi network which uses local SIM service from nearly 200 carriers. It partners with the best providers to offer a seamless mobile WiFi experience for world travelers in over 100 countries using a virtual SIM, which automatically picks up the cellular connection in your area. Using Skyroam means you don’t have to mess around with changing your existing wireless plan or worrying about roaming and overage charges. The SOLIS looks like a bright orange hockey puck that has a power button on the side and a WiFi button on top. 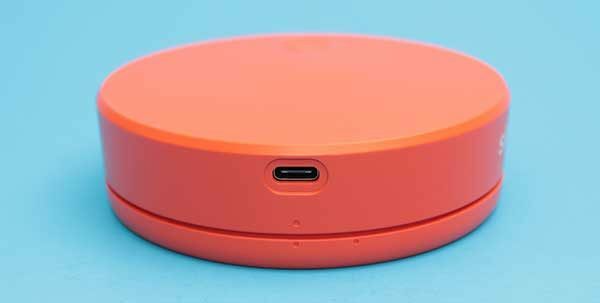 On the back of the SOLIS is a USB Type-C connector that is used to charge the device which can run for 16 to 20hrs on a charge. The Type-C connector is also where you connect the Type-C to USB adapter so you can use the SOLIS as a back battery for your other gadgets. The bottom cover of the hotspot can be removed to provide access to the battery compartment. In an age where our gadgets are usually sealed, it’s refreshing that the Skyroam SOLIS has replaceable rechargeable batteries. As mentioned above, I was excited to receive the Skyroam SOLIS the day before we were planning visit Turkey Run State Park where I knew that there would be no WiFi at the cabin we’d rented. I made a mistake of not setting up the SOLIS before we left figuring I could do it when we got to our destination. That was almost a fatal mistake because the first thing you have to do to set up the SOLIS is to create an account – ONLINE. Our Verizon phone barely had a signal, which made getting online to check my email for the account info almost impossible. After several tries and some patience, I was able to create the initial account and the SOLIS began the connection process. You have to sit through this loading screen every time you disconnect from the SOLIS hotspot and reconnect. It can take several minutes. Luckily, SOLIS gives you 20 minutes of free time to set up the hotspot, but without a reliable connection where we were staying, it took a few tries to get it up and running. Once you’re fully connected, you can buy your daypasses. The SOLIS comes with one pass and each additional pass after that is $9. Each daypass gives you unlimited internet access for 24 hours. Note that you can’t turn off the SOLIS an hour after initiating a daypass, wait a day, turn it back on and expect to still have 23hrs of access left. Each daypass only lasts for 24hrs no matter if you use it during that time or not. Also, if you travel to different countries within a day, the time left on the daypass will be calculated from the time of the location where you activated the device. 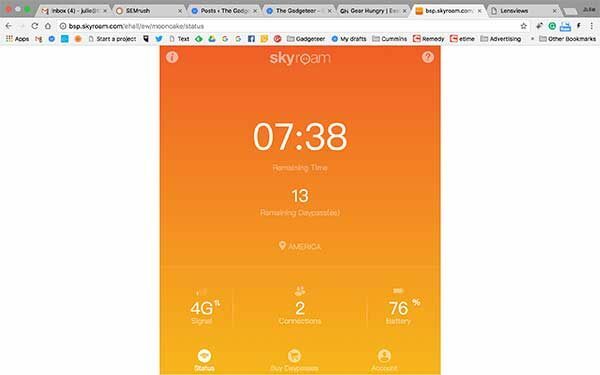 You can always see the status of your connection and time left on your daypass by logging into the Skyroam dashboard. Each Skyroam SOLIS can support up to 5 connections. While we were staying outside the park, we had our phones and my MacBook connected to the SOLIS. The speed was pretty slow and sometimes the dashboard said it was only a 3G connection because there was barely any coverage for Verizon, AT&T or T-Mobile. But whichever wireless carrier that the SOLIS was using at the time, it was good enough for surfing, emailing, and some light Gadgeteer work. 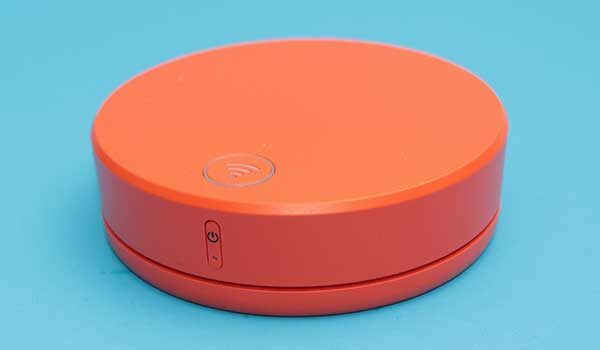 Just be aware that the Skyroam SOLIS is not a magic internet puck. One of their partnered cell providers has to have coverage in your area for it to provide WiFi access. 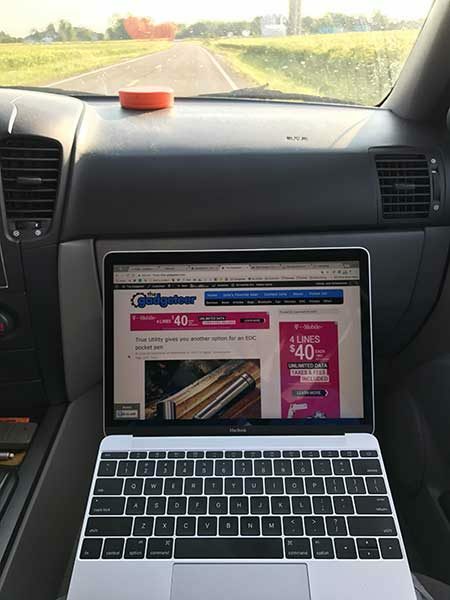 Skyroam even works great while driving which means it comes in handy for long road trips where you might not want to use your phone as a hotspot. Fast forward a few weeks… As I’m writing this review, I’m back home now and am connected to the SOLIS in my basement and have the connection speed that you see above. That probably looks really slow to a lot of you, but it works fine even for watching YouTube and Netflix videos (after some buffering time). When we were at the Turkey Run State Park, the speed of the Skyroam SOLIS felt noticeably sluggish, but I was just happy to be able to surf and respond to emails so I wasn’t complaining. I thought the significant slowness of the connection was due to the fact that the cell providers in that area had very weak coverage. But as I was working on this review, I stumbled upon info that was buried in the Skyroam support pages and it made my heart sink a bit. “Our goal is to deliver convenient, omnipresent global connectivity for international travelers at a great value. To deliver that, we’ve optimized our service to give Skyroam customers the best performance across our global footprint of 100+ countries. Most users experience the fastest speeds possible since the majority don’t reach 500mb in 24 hours. For those that exceed 500mb in 24 hours, data speed changes to 2.5G for the remaining period of the 24-hour daypass, which compares favorably in the telecom market. So I created a test. I checked my speed BEFORE using 500MBs of data (see above) and then I started downloading a 512MB test file. But 30MBs into the download, I was still getting good speed using speedtest.net. So I worked on other things (using the Chrome browser with the same WiFi connection to the SOLIS) and let the test file continue downloading in the background. I watched a few Youtube videos, surfed some of my favorite sites, read news using Feedly, answered emails, and worked on this review. Everything slowed to a crawl when the test file download hit the 220MB mark. At that point, other tabs in my browser would not refresh. I paused the test file download and did another speed test and got the results shown above. OUCH. I waited 10 minutes and ran the speed test again with almost identical results. 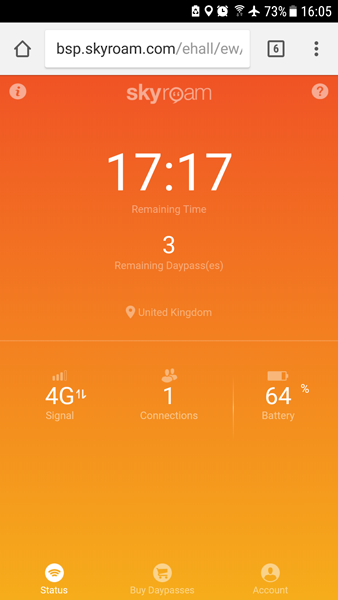 Just to be sure, I checked the Skyroam dashboard to confirm that I was still connected to 4G. I was. I then decided to toggle power on the Skyroam SOLIS, connect back to it and do another speed test. That speed might look much too slow to do anything worthwhile on the net, but right now I’m watching a YouTube video while I’m writing this. Granted, it took a minute or so for the video to start playing but once it started, it was fine. Low res, but viewable. So is reading and writing emails, reading my news feeds using Feedly through a browser, and even writing this review. Bottom line: I do think that the >500MB throttling information should be highlighted for potential buyers instead of hiding it in the Skyroam FAQ pages. What do you think, does a 500MB 4G speed cap make the SOLIS less desirable? 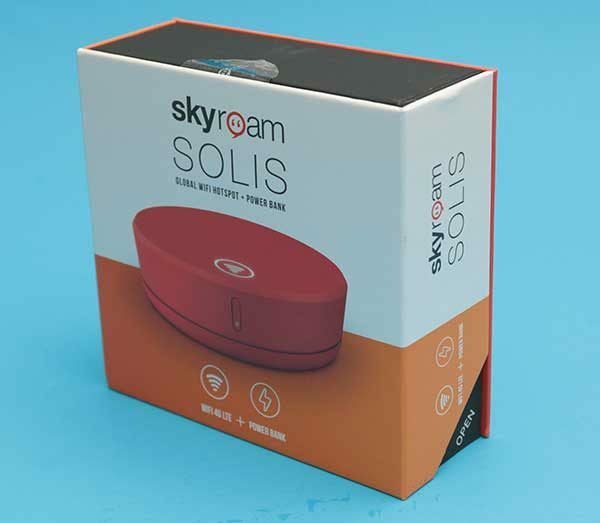 If you are an avid traveler – especially an international traveler who likes to stay connected, the Skyroam SOLIS Global WiFi Hotspot is an affordable way to have internet access where ever you travel (see the country list on the Skyroam site) when you can’t use your mobile phone as a hotspot. As long as you can live with slower 2.5G speeds after using 500MB of data, I think the SOLIS is a useful gadget for on-demand internet access that at an affordable price. After trying Verizon’s international services on a previous trip, I had decided against activating my cell for this trip. Verizon’s international service was pretty lousy and extremely expensive. Verizon did give me steep discount when I complained after returning to the US. Julie loaned me the Skyroam for Europe testing in mid-December. It seemed like an international pay-by-the-day solution might be perfect for my needs. Anytime I would find myself in a place without access to WiFi, I could fire up the orange puck! Initially, I was pretty disappointed in the Skyroam. The first place I tried to test it was in the small (tiny) town of Hosenfeld, Germany. The device would hang at 92% load and never complete. I spent a fair amount of time, restarting Skyroam, restarting the laptop, restarting cellphone, etc., but never could make a connection in Hosenfeld. I later discovered during successful logins in other parts of Germany and in Sweden that a long pause at 92% was not unusual. It is possible that I could have gotten a successful connection in Hosenfeld if I had been more patient, but I really did give it quite a long time to connect. Having said all of that, the connection attempts at Hosenfeld were strictly for testing as I had WiFi access at the home where I was staying. My first successful connection took place in the mountains in Sweden near the Storhagna ski resort in Jämtland. This time it was for real as I had no alternative way to connect to the Internet. I got a 4G connection with really good performance. The connection was shared between two laptops and two cell phones and the performance was better than I would have expected. Very cool to have this kind of connection in a foreign country perched near the top of a mountain. 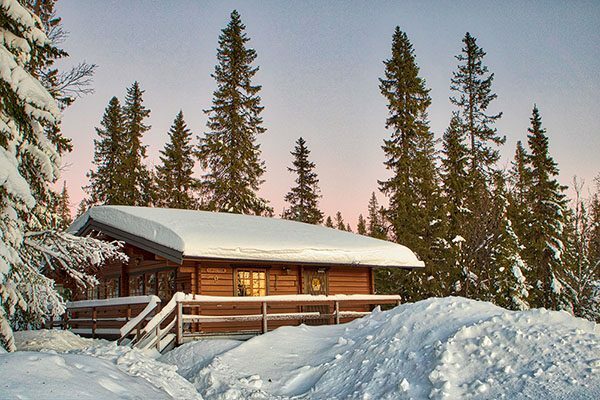 On the last morning at the cabin, I connected and maintained a solid Internet connection from Jämtland (middle Sweden) to Stockholm (Southern Sweden) without losing connection. I was periodically surfing the web, checking email, etc., on my cell. I did occasionally have problems dropping connection over the following days– sometimes rebooting the Skyroam and even restarting my cell phone a couple times to get it going again. Most of the difficulties happened after a token expired and I was trying to use a new Day Pass token. There was one other minor annoyance. Sometimes the Skyroam login page would freeze at 100%, but never switch over to the status page. Typically refreshing the login page would fix this problem and get me over to the status page. 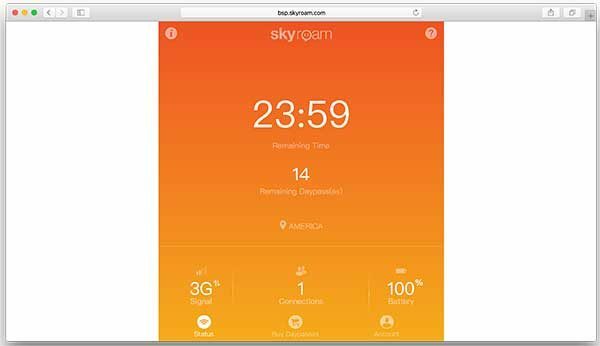 Overall I found the Skyroam exceeded my expectations and I would recommend this device to anyone traveling outside of their regular cellular coverage area. Thanks to Julie and Skyroam for keeping me connected during my travels! Source: The sample for this review was provided by Skyroam. Please visit their site for more info and Amazon to order. Well darn about the data throttle. I have a friend that runs a photography business and she used to use a device from Cricket or one of those that no longer is around that would let her use unlimited data. The 0-4 times in a month when she was at an event she would use the device to upload the pictures to her website. That way if people did not want to buy a print or download on site she could tell them to go to her website and the pictures would be there right away. With the data throttle on this device the pictures would never get up there. The only options she can seem to find now are ones that require year long contracts and are very expensive. Having something you could pay for by the day would seem to be the best deal. Let me know if you ever see something available that can handle unlimited data at good speeds. Looking forward to trying this out in Europe this Winter. Austria, Czech Republic, Germany, & Sweden are on the itinerary and all listed as supported. That should be a good test for this little device! It all seems reasonable until you think about that 5 devices idea. Let’s say just three devices and between just a few videos and sending some pictures that 500 meg cap is gone. Then consider the no real magic of it using local service providers. 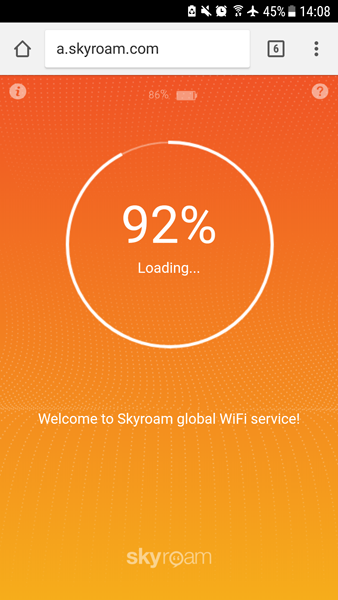 With only some minor planning and the almost ubiquitous dual sim phones available for less money than the Skyroam device costs, making sure you have decently fast internet access isn’t all that hard to get. Intitally I thought Skyroam would have been using some kind of satellite access and that would really make sense but it really is just sim in software with a very low data cap. Buffering a 2 minute video for 2 minutes isn’t worth it and sorry to say, buffering a Netflix video doesn’t really help when there isn’t a full length movie they stream that is less than 500 megs. As wifi becomes ever increasingly available, unless you are way out somewhere, wifi is yours for the asking. 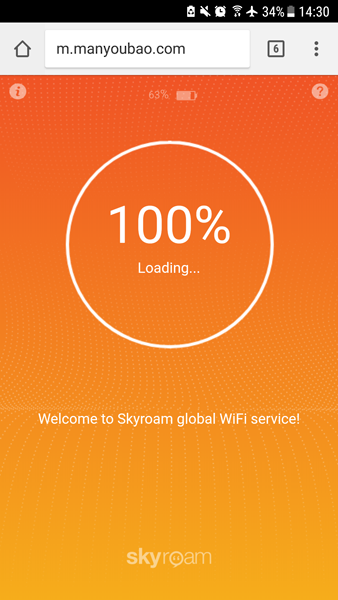 If you are someplace that doesn’t offer or have wifi the chances of Skyroam having a good connection isn’t likely either. 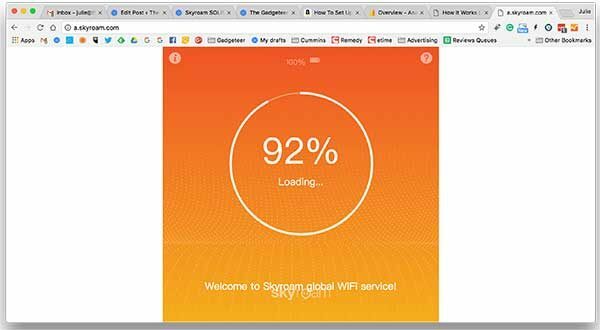 Skyroam missed the mark and their explaination of the data cap reeks of corporate PR speak no better than what the telecoms put out, the never seen never known typical customer who needs 500 megs. Is that you? It sure isn’t me and I’d bet that the typical reader of a tech industry review website blows through 500 megs without even trying. So basically you write a review that you dont like it. Then you get an affiliate deal with them and now theyve exceeded your expectations? Hello Arthur, Thanks for your comment, but you didn’t read very closely. 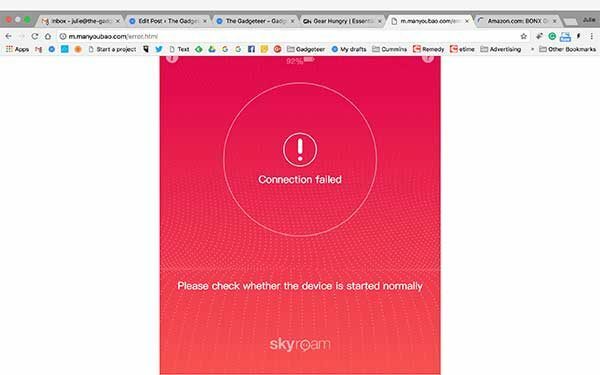 Skyroam didn’t exceed my expectations when I used it here in my area of the US. It was my friend who liked using it when I loaned it to him for a trip to Europe. And no, we don’t have an affiliate deal directly with Skyroam although since they do sell through Amazon, purchases through the Amazon link might earn us a dollar or two because we do have an affiliate deal with Amazon. Hope this clarifies things for you. Do not get tricked in to buying one of these devices. I tried to purchase on online, 10 days before travelling. I was assured it would be delivered in time. It wasn’t. I then came across a vending machine full of them down at the Miami airport and bought one. My first attempt to use it was in the Turks and Caicos Islands, an island where my Canadian smartphone works just fine, data and all. It connected just long enough to activate the day pass and then didn’t work at all. Next attempt was Brampton, Ontario, right next door to Toronto. 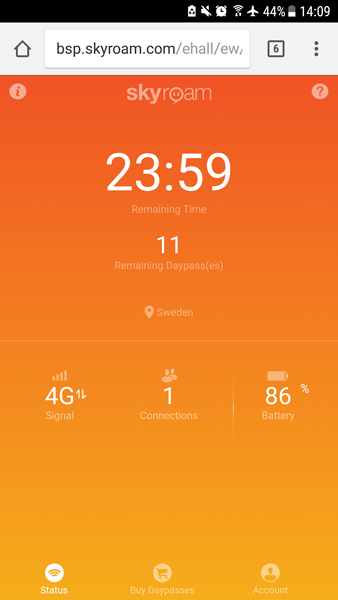 Full 4G on my cell phone, the Skyroam connected for about 30 minutes then spent the rest of the 24 hour day pass dropping the connection every 30 seconds. I ended up tethering everything with my smartphone. After contacting customer support they were responsive and got back to me quickly but were unable to do anything or fix the problem. The one customer service rep insisted that my slow speeds where part of their fair use policy. The speeds and connection were so poor, I could not even open the Google Homepage. In short, this device does absolutely nothing your smartphone cannot do better and cheaper. I am sorry I purchased one, and would like to make sure no one else makes the same mistake. I am using a SkyRoam Solis now for a year, at an average of 20 days a month. And I would like to add some points here to the discussion. SkyRoam Solis is a business oriented solution, not a private oriented solution. I use the SkyRoam Solis from a professional point of view, and that is for me its goal. The Solis is for me there to allow an easy connectivity to receive my emails for my job, and reply to these. Next to that also to find needed information for possible replies. But it is professional. So now I don’t go looking at YouTube 3 hour movies while waiting for my plane, or decide to connect to FaceBook and watch all the pictures in full resolution because the meeting is boring. A person gave a comment about a photographer wanting to use it and being capped by the 500 Mb data. Sorry to say so, but this sounds for me a wrong business idea. Is the need to upload 100 full HD pictures to your website to show them immediately an urgency? I don’t think so. Anyway the people who could be interested in them are at the event, and so have no time to look at them or download them immediately. They will only look when they sober up a day later and got home when the event is finished. Oh yes, I forgot. I do sometimes sends full HD photos over it because of my job, but I did learn that there is something existing on the net called archiving tools, like*zip, or *arc, allowing you to send urgently pictures compressed to someone. The Solis is there when you need internet urgently, and for me that is perfect. If I really need an Unlimited local high speed connection, I just get me a local pre-paid sim, and plug it in a mobile wifi router. So would I advice the SkyRoam Solis to anyone? Yes, if you want to use it professionally in urgent moments. No, if it is your idea to binge watch movies while sitting on the tram, or bus. And to be honest if you go in a cabin on a mountain top, for a weekend, I do suspect the goal is to savour nature, not to watch movies. And for the travellers, if you travel as much as I do, when you arrive in many of the hotel chains, they know you so well, that your room internet is free and unlimited. And to be honest, if you travel a lot for your job, I don’t think I need to explain all the tricks you can use to bring down your data consumption.